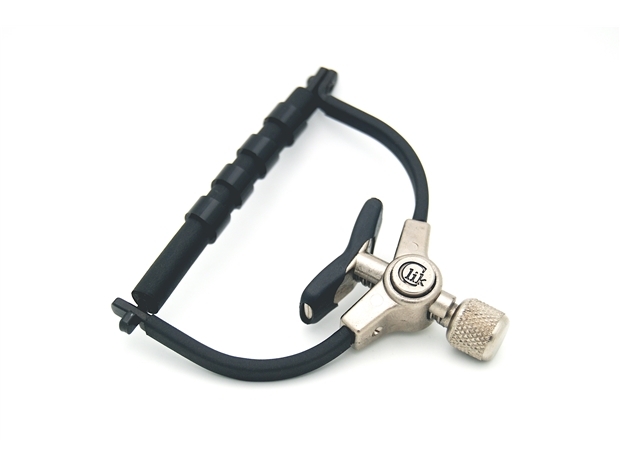 Clik capo from Paige is on and off quickly with the same balanced tension the Original capo offers. Push the centre thumbscrew 'til it touches the neck, twist it a half turn or so and you're in business. To release, untwist a bit, then push the round button to completely release tension. Has the same profile as the wider 6-String capo. Also, innovatively incorporates 4 small clear tubes which position over the smallest of the E, A, D, and G strings to eliminate string buzz and excess pressure, resulting in detuning. Width 2-1/4", Open Depth 1-1/8", Closed Depth 13/16"